Sussex Police has confirmed a herd of cows, one of which reportedly strayed onto the A27 at Polegate yesterday afternoon, have been rounded up safely. A cow was sighted on the Cop Hall roundabout in Polegate, which links the A22 and A27, late on Thursday afternoon, according to traffic reports. Sussex Police tweeted: “Persistent problem over the past few days with a herd of cows which keep escaping on to the A27 at #Polegate. “Anybody missing some cows? Or know who might be? 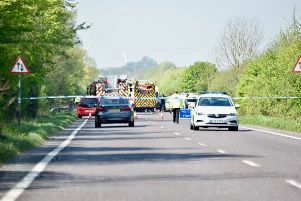 The traffic was made worse due to temporary traffic lights on the Polegate Bypass due to a collision on Wednesday. A few hours later police confirmed that the owner had been found and the cows had been rounded up safely. “The owner has been found and the cows rounded up, so hopefully no more jaunts on to the A27 (seems the grass was greener on the other side after all),” police tweeted.